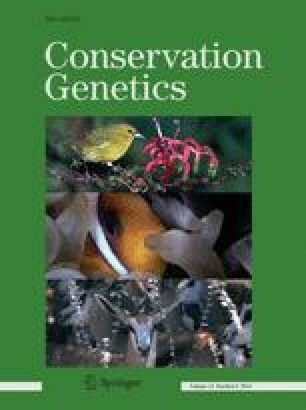 Defining genetic populations and detecting hybridization with introduced or domestic taxa are two major concerns for the conservation of population-level diversity. We studied the genetic population structure of large, migratory caribou herds (Rangifer tarandus granti) on Alaska’s North Slope and their potential hybridization with introduced domestic reindeer (R. t. tarandus). Using a population genetics approach, we determined: (1) whether the four caribou herds could be differentiated; (2) how distance and population size appear to drive genetic population structure; and (3) how contact with reindeer has affected the genetic identity of herds. Samples from four caribou herds (n = 245) and reindeer (n = 67) were analyzed at 19 microsatellite loci. We found that North Slope caribou are isolated by distance, with no differentiation among herd pairs except for the most geographically distant herds (F st = 0.003, Jost’s D = 0.023; P-values < 0.001). We detected reindeer-caribou admixture in all populations except Kodiak Island, including 8 % of individuals in caribou herds and 14 % of individuals in Seward Peninsula reindeer herds. However, considering the stable or increasing trend in North Slope herds, reindeer introgression has had no apparent deleterious effect on herd demographics. Our findings indicate long-term genetic exchange among North Slope caribou herds when their ranges overlap, and suggest that herd size may influence susceptibility to reindeer introgression. As North Slope herd ranges are increasingly altered by industrial development, this study can provide a baseline for detecting potential future impacts to what are currently large, diverse, and naturally evolving herds. The online version of this article (doi: 10.1007/s10592-013-0499-2) contains supplementary material, which is available to authorized users. Funding for this research was provided by the National Fish and Wildlife Foundation award #1499, Alaska EPSCoR NSF award #EPS-0701898 and the state of Alaska, a Resilience and Adaptation Program (National Science Foundation IGERT) fellowship to K. Mager, and a Social Science Research Council Dissertation Proposal Development Fellowship to K. Mager. D. Cooley, J. Dau, E. Lenart, L. Parrett, B. Person, and T. Wertz coordinated sample and location data collection. Blood and tissue samples were collected by the Alaska Dept. of Fish and Game, North Slope Borough Wildlife Dept., U.S. Fish and Wildlife Service, Yukon Government of Canada, UAF Reindeer Research Program, D. Moto, and by K. Mager with permission from the Ongtowasruk and Davis reindeer herding families (UAF IACUC protocol #09-08). Caribou location data were provided by the Alaska Dept. of Fish and Game, North Slope Borough Wildlife Dept., U.S. Fish and Wildlife Service, Yukon Government of Canada, and the U.S. National Park Service. Caribou and reindeer range files for ArcGIS were provided by T. Paragi of Alaska Dept. of Fish and Game and by D. Blodgett of the UAF Reindeer Research Program. D. Paetkau provided valuable help with marker selection. We thank J. Dau, E. Lenart, L. Parrett, F. S. Chapin III, K. Kielland, G. Roffler, and five anonymous reviewers for providing helpful comments on the manuscript.